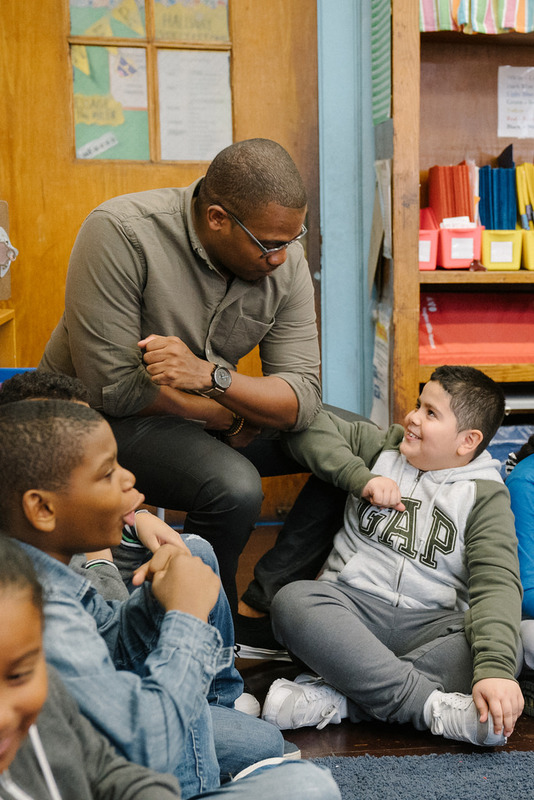 Joel Scott joined Turnaround for Children in 2015 as an Instructional Coach in New York City and Newark, New Jersey. He facilitates professional development sessions, coaches teachers, and works with school leaders to establish teams that address students’ academic, social, emotional and behavioral challenges. THE 180: Did you always know you wanted to work in education? JOEL SCOTT: Education has always been the family business. My mom was a teacher in Grenada and most of my aunts, uncles and cousins are teachers as well. When attending Binghamton University, I was a psychology and African studies major because I really wanted to do therapy for children of color, particularly for black boys. However, once I got into schools to observe and experience classrooms, I went from the therapist’s chair to the teacher’s desk. THE 180: In your role as instructional coach, what does your day-to-day look like? JOEL SCOTT: No two days are the same; I walk into school, I check in with teachers that are in my coaching cycle, discuss issues of practice or provide perspective on a student that they are struggling with. I want to make sure that the teachers know that I’m physically in the building and that they can have these conversations with me. During the day, I coach teachers around our curriculum. For instance, right now classroom behavior management and community building are two big initiatives at PS 32 – The Belmont School. In these sessions we’re observing practice, analyzing data, and co-planning with the school leaders and teachers towards success in the classroom. I also meet with the school’s coaches to provide strategies to support and train school staff. We’ll talk about one teacher or a couple of teachers that they are working with, and I walk them through methods that they can use to be more effective with their colleagues. When I’m not coaching, I’m planning for the professional development sessions that we have every Monday with the teachers. I am always checking-in, meeting or planning with my team. My teammates are very valuable to me and the work. THE 180: What’s the greatest thing you’ve learned working with your colleagues? JOEL SCOTT: I think the greatest thing is collaboration and perspective, because I do come in with a teacher’s lens, and everything I see is through the eyes of the teacher. But my colleagues Renee, Amy and Ronni bring different perspectives from their backgrounds. For example, sometimes a teacher will come up to me and say, “Hey I’m really struggling with this student,” I’ll take Renee [who is a social worker] with me to observe, and then I’ll give my feedback, and then she’ll give hers. We then start strategizing how to better support that student and teacher. THE 180: What are some of the most common challenges that you see teachers face in the classroom? JOEL SCOTT: Think about who a teacher is. They are parents, instructors, psychologists, firefighters, nurses, event coordinators and pilots. They’re a mix of all these high intensity, high stress jobs and they’re doing it with a lot of children. I think the challenges facing teachers are mostly around classroom management because as you work through teacher prep programs you are taught to have knowledge in content areas, how to teach a lesson, but not how to manage behaviors. While teachers may know how to differentiate and write a lesson plan and implement, management is not something that is explicitly taught to you as a teacher. Then include the social and emotional challenges of the students; teachers really struggle with meeting the kids where they are emotionally. It’s hard to teach when you don’t have relationships with students, and you don’t know how to create one. Sometimes I’ll hear, “So I’m supposed to have a better relationship with this student, but I don’t know where to start.” And then I say, “All right, so we’ve identified our problems, let’s create some steps to solve for that.” My role is to bridge teacher to student, and student to student, in a positive way. THE 180: What are the challenges that you see students facing? JOEL SCOTT: I think the main challenge facing them is that they’re constantly anxious and stressed. We talk about stress to staff because students haven’t developed the tools to better self-regulate just yet. There is frustration, there is anger, and these emotions sidetrack them to the point where they almost feel like they to need restart the day throughout the day. When they struggle with these emotions, they can’t get themselves under control, and that’s what shows up in classrooms. It not only wears on the student who is struggling but it wears on their classmates and the teacher. Another problem students have is they have such different lives and varied experiences and can’t find common ground. The teacher is the person setting the climate in the room. Either it’s going to be a sunny day or it’s going to be a storm; you want to make sure that teacher is setting a great climate for the kids as everyone in the classroom looks for that common ground that brings them together. You’re hoping the student and teacher have a great relationship or are developing one so that foundation is being firmly set. This foundation is so important because it translates to other adults in the school. When the student comes to the building they should have great relationships with the security guard, the assistant principal, the principal, the teachers, and their peers. You want to make sure that those relationships are carrying them throughout the course of the day, but sometimes they’re not there and that’s when they feel challenged and that’s why it’s hard for them to learn. THE 180: What would you say is the most important thing that students need to succeed? JOEL SCOTT: They need an environment that’s physically, socially and emotionally safe. Emotionally safe so they can come in be themselves, take risks, feel safe, and they can be their genuine self. Nothing is better than being you and being yourself in a space where you feel you can do that. THE 180: You have a two-year-old nephew whom you absolutely adore. What do you hope for him as he starts school? JOEL SCOTT: I hope the teachers Ezra encounters believe he has unlimited potential, and really want him to succeed. I hope they try to understand who he is, where he’s coming from, and they build a good relationship with him. I got into education to make sure that all students walked into a room with a great teacher to provide them the opportunity to learn in their own way. I really hope Ezra has great teachers that think the very best of him, and I have the same wish for all children.